The Photobert CheatSheet for the Nikon D300 Digital SLR is a one-of-a-kind CheatSheet. If you own this camera you know what an amazing device it is. But who can remember all of those functions? This CheatSheet is like having the manual on a card - but better! It's a concise summary of what's in the manual. It's is an "easy to take with you", invaluable quick reference. It's printed in full color on both sides of a full-sheet of paper that's laminated with a light 3-mil laminate and is folded in thirds. Box Dimensions (LxWxH) 8.9 x 3.72 x 0.03"
CheatSheet for Nikon D300 Digital SLR Camera is rated 3.7 out of 5 by 11. Rated 3 out of 5 by The Tennis Pro from Nice Product I brought this cheat sheet hoping it would make the Nikon D300 learning curve a little quicker. It didn't hurt but wasn't that helpful. It gave great a outline of the camera, function buttons and brief description of the camera parts. What it didn't give was the reason you would need to use a specific application and the success or option if you didn't. While I know it wasn't intended for that purpose, it would have been nice to have a brief explanation of why we would use this part of the camera anyway. It is jammed packed with info and could be used as a reminder should you forget the many functions and shooting opportunities the D-300 has available. Rated 5 out of 5 by Anonymous from Very handy tool This CheatSheet is a handy tool to have on hand during a wedding or any other project. 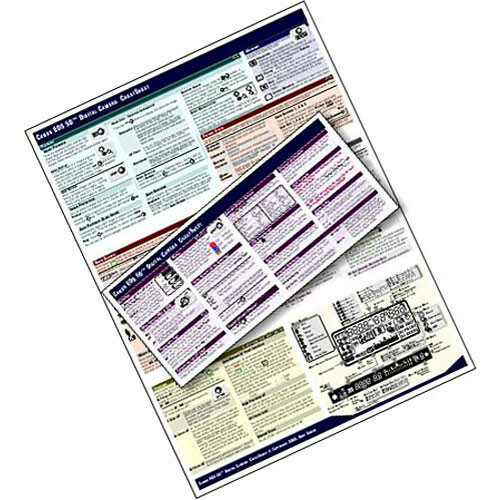 It has all of the basic info you would need to reference in a hurry and the lamination is a nice feature. This is definitely worth the money even if I only use it once a year... I like the security of having it on hand just in case. Rated 3 out of 5 by Anonymous from Good but not if you've read the manual The CheatSheet is good to have. However, I've read the manual (and referenced it quite a few times before buying the CheatSheet) and thus, the CheatSheet isn't very useful to me. If you're too busy to thoroughly read the manual, this is good to have. Rated 4 out of 5 by Dustan from Great Quick Reference The CheatSheet condenses a 400 page manual to a 1 page front and back cheat sheet. Provides a great quick reference without having to carry around a massive manual. Rated 5 out of 5 by Anonymous from I love PhotoBert's cheat sheets Like the ad says, it's like having the manual on a card - at least the important parts. I have them for all my cameras and will never be without them. Rated 4 out of 5 by Breakaway from D300 CheatSheet Excellent. Nice to be able to carry around no weight. Fairly easy to understand and read. Rated 2 out of 5 by Corvette Rick from The book manual is better, even backpack Tried to put too much into too small a place. The idea is great but does not work for me.